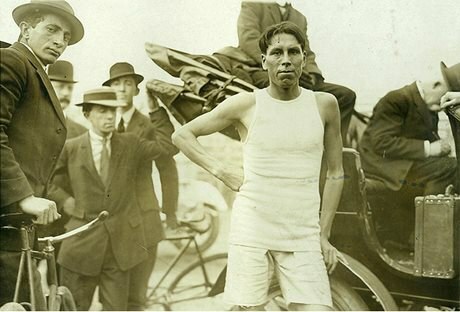 Fred Simpson Sr. (1878-1945) was a talented marathon runner and one of the first aboriginal athletes to compete in the Olympic Games. Simpson grew up in the First Nation territory of Alderville at a time when most transportation and work was done on foot. At the age of 20, he moved with his wife Susan Muskrat to Hiawatha, a reserve on the north side of Rice Lake. He began training as a runner in Hiawatha and, in 1906, placed third in the Peterborough Examiner road race. Simpson trained as a member of the YMCA Harriers in Peterborough and, within two years, was one of the top runners in the world. At the 1908 Olympic Games in London, England, Simpson finished sixth in the marathon event, ahead of fellow Canadian Tom Longboat. In January 1909, he became a professional runner working with manager, trainer and promoter, Tom Eck, and travelled throughout Canada and the eastern United States. Simpson retired from running in 1912 to spend more time with his family and to work on the family farm in Hiawatha. Learn more about Simpson on the Alderville First Nation website. Read an article on Fred Simpson, written by Janice Forsyth, in the Trust’s magazine Heritage Matters.